If you've noticed your Gmail inbox these days you will find that it is divided into 3 tabs namely "Primary", "Social" and "Promotions". Due to this change it may so happen that some of the important communication emails(job alerts, password recovery emails, notification emails, etc ) from Wisestep may be categorized as 'Promotions' by Gmail and all emails might have been placed in that tab. So we thought of sharing three easy steps which ensures that our emails will land under the 'Primiary' tab always for you. Click on the Promotions Inbox tab inside Gmail. Drag your 'Wisestep' emails from 'Promotions/Social' tab and drop them onto the Primary tab. Mr. Roy referred Nathan for a plum job at a reputed investment bank. Two weeks later Nathan was hired. Nathan, wasn't even looking for a job. He was surprised when he got the interview call from the company and, ecstatic when he got into a wonderful firm, a job he would give anything to get. All because his friend Mr. Roy knew Nathan's skills and figured he would be perfect for the offered position. a) Mr. Roy who referred Nathan, was an existing employee of the company. Existing employees understand the requirements, challenges and benefits of working with a particular company. They also understand what it takes to work in such an environment. Hence, they best understand if a person they already know would be likely to suit the open roles, in the company they work in. b) Companies like the investment bank in question, and the like receive hundreds of applications each day for open positions, through their website. Whenever they receive referrals, referrals are given priority over those hundreds of other applications, and interviews are conducted for referrals first. The most desirable candidates, nicknamed “purple squirrels” because they are so elusive, usually come recommended, that is,through referrals. Its definitely possible that someone you already know may know someone who can help you find the job you're looking for. Which is exactly what referrals are about. Referred candidates are twice as likely to land an interview as other applicants, according to a new study of one large company by three economists from the Federal Reserve Bank of New York. For those who make it to the interview stage, the referred candidates had a 40 percent better chance of being hired than other applicants. Referral programs carry important benefits for big companies. Besides avoiding hefty payouts to recruiters, referred employees are 15 percent less likely to quit, according to Giorgio Topa, one of the authors of the Federal Reserve Bank of New York study. As a result, within the last two years, firms like Deloitte, Ernst & Young, and Booz Allen have created dedicated teams within their human resource departments to shepherd prospects through the system. Over all, Deloitte receives more than 400,000 resumés a year, but recommended employees are guided along by a 12-person team. In particular, Wisestep has altered the hiring landscape, making it easy for recruiting departments to trace connections between job candidates and their own employees by using its database and software. Did you know that Wisestep allows you to post and share jobs using LinkedIn groups? Check out our referral rewards section to refer friends and win, just with a click. We set about solving these problems and have some simple but elegant answers to most of them. 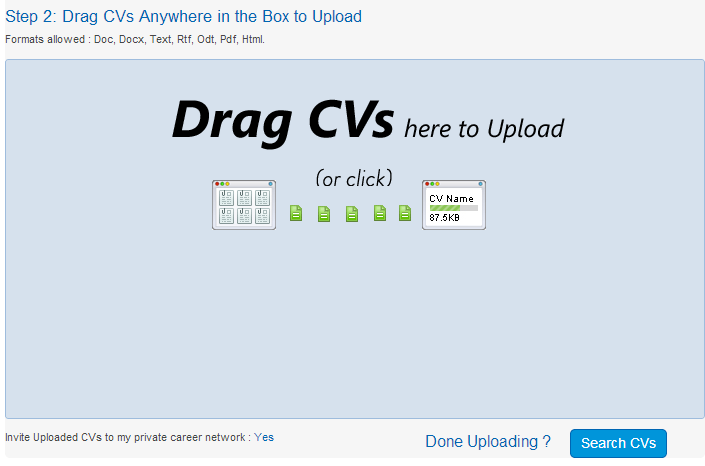 We have introduced is as the “CV Database” feature on Wisestep.com allowing recruiters to store and access their CV database on the Go. 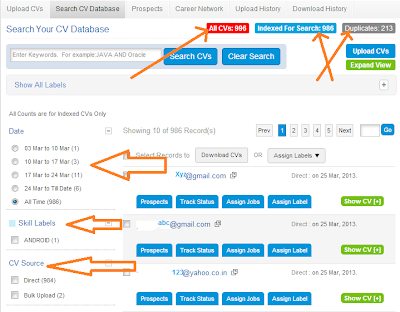 4) Once the CV's are uploaded they will be available for Search shortly thereafter. We will also generate some interesting stats for your Database like: Total Cvs, Duplicate CV's, number of Labels etc.